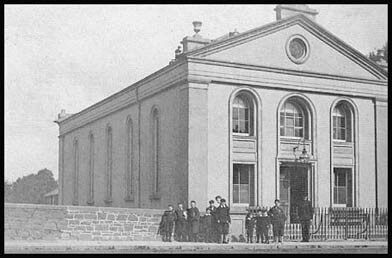 The Masonic Hall was originally the Meeting House of the 2nd Unitarian/ Seceding Presbyterian congregation. It was opened on 6th October, 1844 and held by virtue of a long Lease from the Marquess of Downshire. It closed c. 1880 due to congregational divisions. The Leasehold interest was bought by Lodge 336 in 1893 for £390. As you can see from the Lodge History the Freehold interest in the property was subsequently purchased from the Marquess. We now arrive at the consideration of a venerable Lodge, the early part of whose history is unfortunately enshrouded in mystery, my esteemed Bro. Thomas Robinson informed me that he “can find no records further back than 1830 when the Lodge met in the Railway Hotel, and subsequently occupied the same premises as Lodge 124,” to which I have already referred. The warrant of Union Band Lodge No. 336, was issued on the 4th day of October, 1759, to Bros. Alexander Fullerton, John O’Caine, and James Crawford, of Banbridge. The present date is, therefore, one of great interest, marking, as it does, not only the dedication of your beautiful Masonic Temple, but also pointing to the fact that this venerable Lodge, although today it completes one hundred and thirty-nine years of active Masonic life in your town, is still hale, hearty, and vigorous. Long may it continue faithfully to disseminate within these walls those great principles, a close adherence to which has doubtless been the guiding star of its youth, the glory of its manhood, and the pride of its old age. Although the early Craft records are missing, the Lodge is still in possession of many articles of extreme interest to the student of Masonic history. Prominent amongst these treasures we find:- The original banner of the Lodge in a wonderful state of preservation; a very perfect manuscript copy of the “Charges, regulations, and bye-laws of the Order of Royal Arch Knight Templar Priests.” The old “Priestly Order,” as it was termed was worked by a body termed a “Union Band,” which was ruled by a president and seven warranted masters, each of whom had his seal of office; and it is evident that it was from this connection that the Lodge took its name. The Lodge is in possession of an almost complete set of the seals belonging to the “Banbridge Union Band,” copies of which I have been kindly permitted to take; and I am proud in myself being the fortunate possessor of two very beautiful old certificates issued by the Banbridge Union Band, which show that the Priestly order was conferred by the Lodge so recently as 1833. Four very perfect old seals used in the working of the Craft, Royal Arch, Knight Templar, and Red Cross degrees, all of which were in former times conferred by the Lodge under the sole authority of its craft warrant. A beautiful old oak chair which bears the date 1623. A very fine old grand-father’s clock, the dial of which is richly ornamented with Masonic emblems. This clock was the property of a Bro. Robert Martin, and was in 1815 used in Lodge No. 214, Loughbrickland. Getting into reduced circumstances, Bro. Martin disposed of it by raffle, and it was won by a Bro. Davison. Ultimately it came into the hands of Bro. Samuel Watt, who presented it to the Lodge in 1875. On the 5th of March, 1844, the Lodge gave a supper to the brethren of Banbridge and the vicinity on the occasion of their taking possession of their new rooms in the house of Bro. A. Kirker; on which occasion, in replying to the toast of “The Queen and the Craft,” a Bro. Lutton, probably Bro. John Lutton, whose signature is attached to both of my certificates, with some degree of pride referred to the fact that he had been for upwards of sixty years a member of the Order. In the month of March, 1860, we find the Lodge entertaining their W.M., Bro. Edward Radcliffe, and their J.W., Bro. Robert Bell, on the eve of their departure for America. In the month of May 1863, it presented Bro. Peter Shade, manager for Messrs. Green and King, who constructed the line of railway between Banbridge and Lisburn, with an address on the occasion of his departure for Spain. On the 30th of March, 1869, Bro. John Scott was presented by Lodges 124 and 336 with a handsome clock and two Masonic Jewels, on the occasion of his leaving Banbridge. Bro. Andrew M’Clelland, P.G. Sword Bearer, 1876; P.G. Steward, 1877, 1878, 1881, and 1882; P.S.G.D. 1883-4; P.J.G.W., 1885; P.S.G.W., 1886, Bro. William MacCormac, P.G. Steward, 1882-4; P.S.G.D., 1887; P.S.G.W., 1888. Bro. Thomas Robinson, P.J.G.D., 1882; P.S.G.W. 1883. Bro. M.W. Blackwood, P.G. Steward, 1887. Bro. William Tweedie, P.G. Steward, 1891; P.J.G.W., 1892.